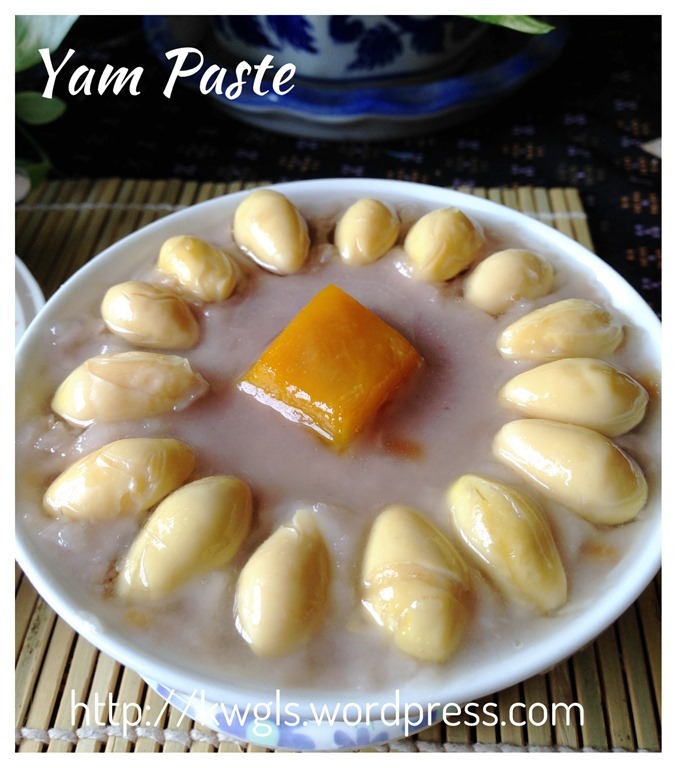 I prepared some Hakka Abacus Seeds yesterday and I have some left over yam paste. 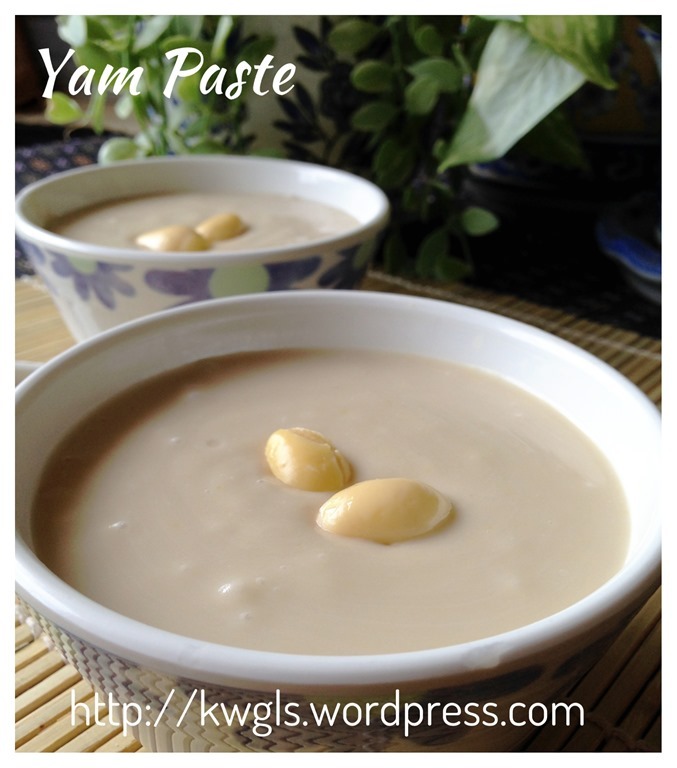 I therefore decided to use these yam pastes to prepare the Teochew famous dessert – Or Nee. I don’t actually intended to issue this recipe as it was captured in my Facebook Page already. 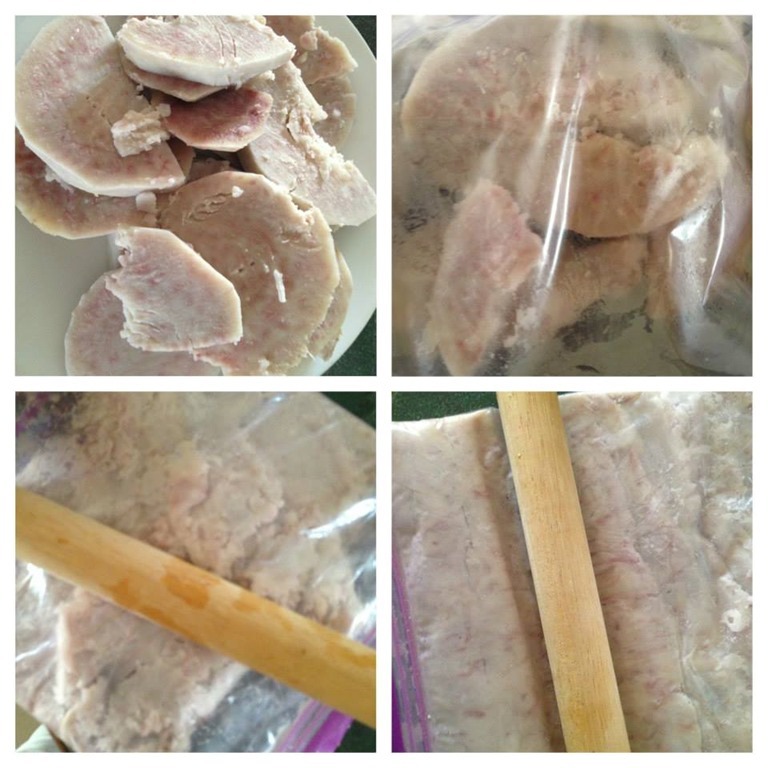 However, when I posted the pictures in Facebook Groups, members of the Group are requesting for the recipe. 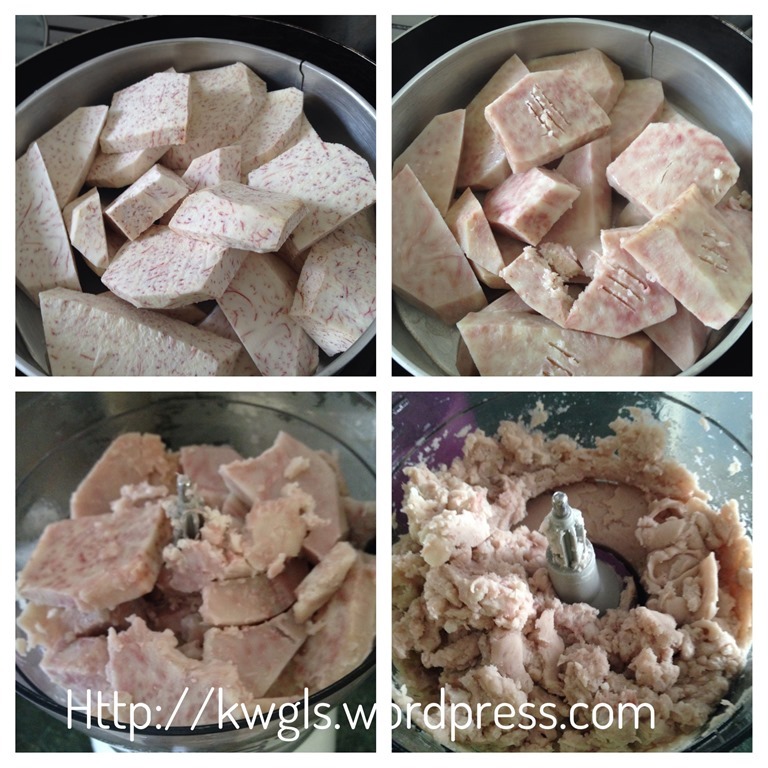 I have therefore decided to transfer the previous recipe to this main blog. Because the recipe was written earlier in a different format, therefore, the method of writing in this post will be slightly different from the recent post. 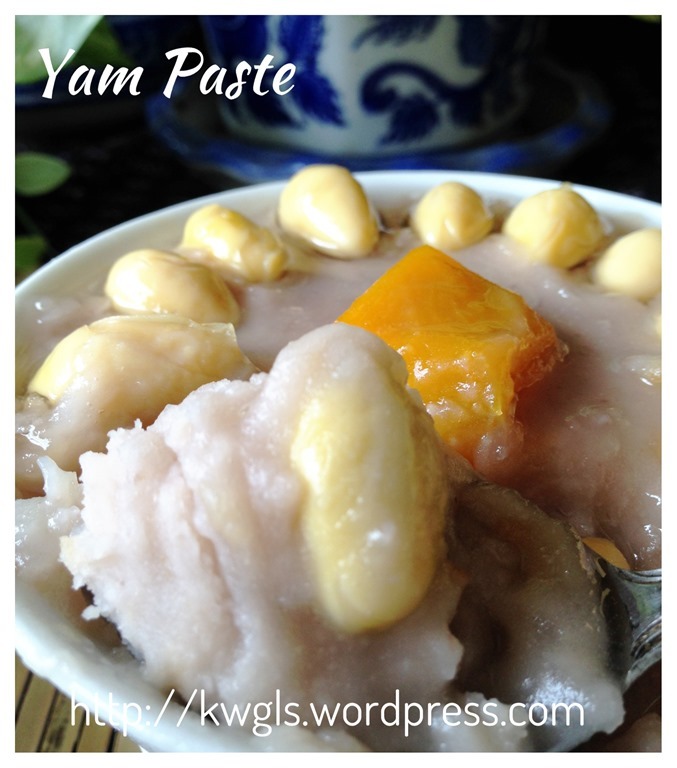 Or Nee is an authentic traditional Teochew desserts using yam or taro as the main ingredient. Almost all Teochew restaurants will have this dessert. 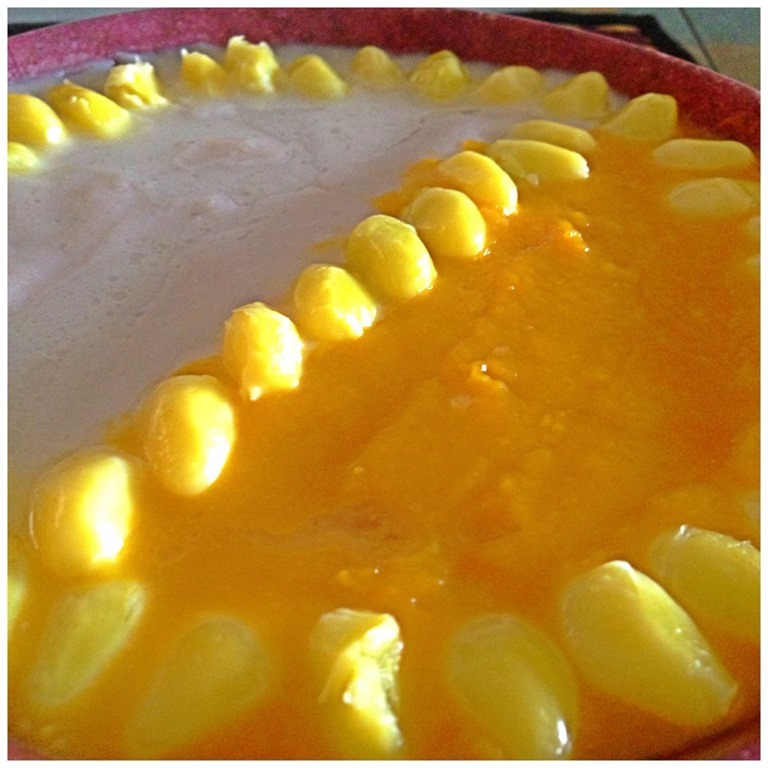 This is not a difficult dessert to make except a bit laborious. 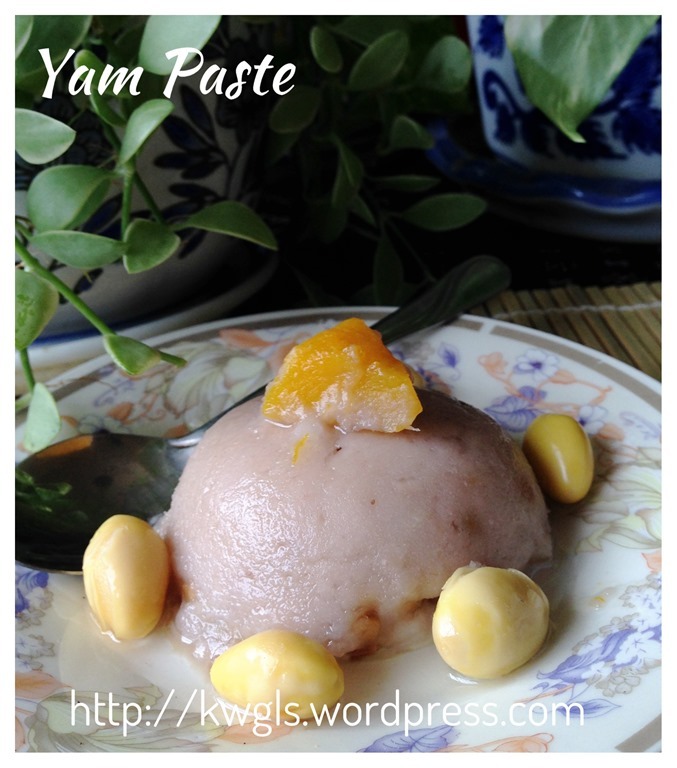 Chinese have a saying: “做芋泥没功夫，糖油做师傅” and literally translated as “No kungfu is needed in the preparation of yam paste, but oil and sugar are the shifus”.. 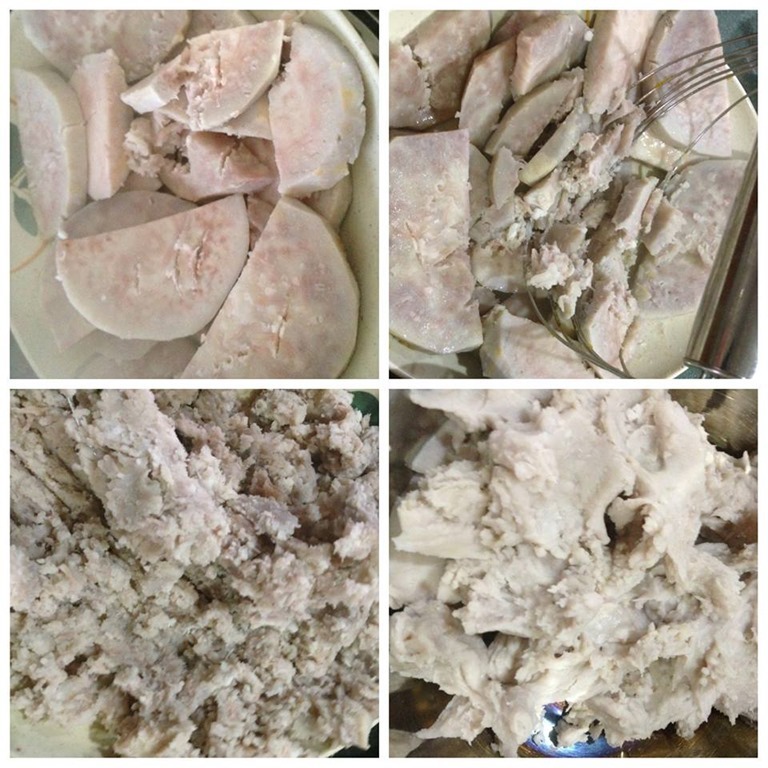 It means that the preparation of yam paste is very simple, but what constituted a good bowl of yam paste is the quality of sugar and oils used. 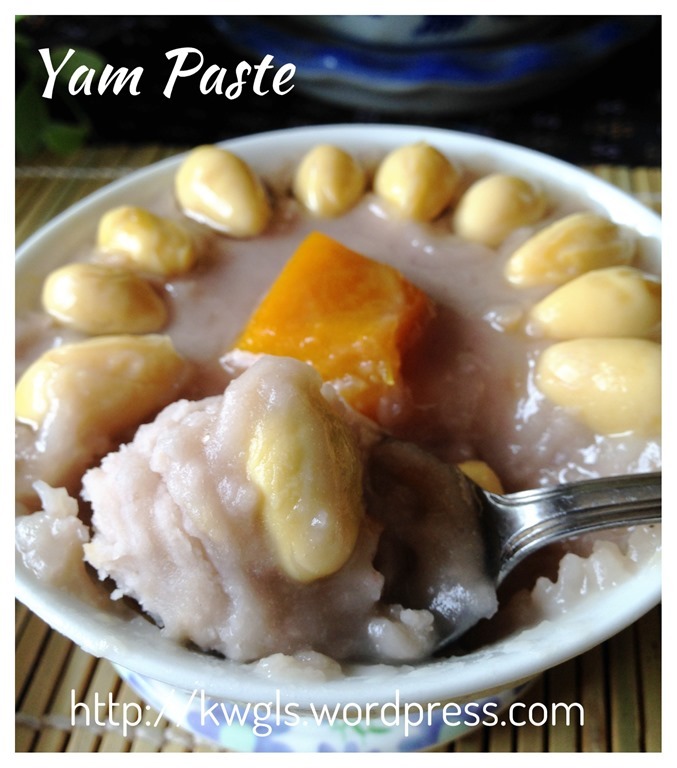 Traditionally, yam paste was prepared using lard and in this illustration, lards were used as well. Of course, besides oil and sugar, the quality of yam is also very important. Generally, in Singapore’s and Malaysia’s restaurant, Orh Nee was served either in a thick paste form or creamy form. They are essentially the same except for the creamy form, some coconut milk or fresh milk were added to thin the thick paste. 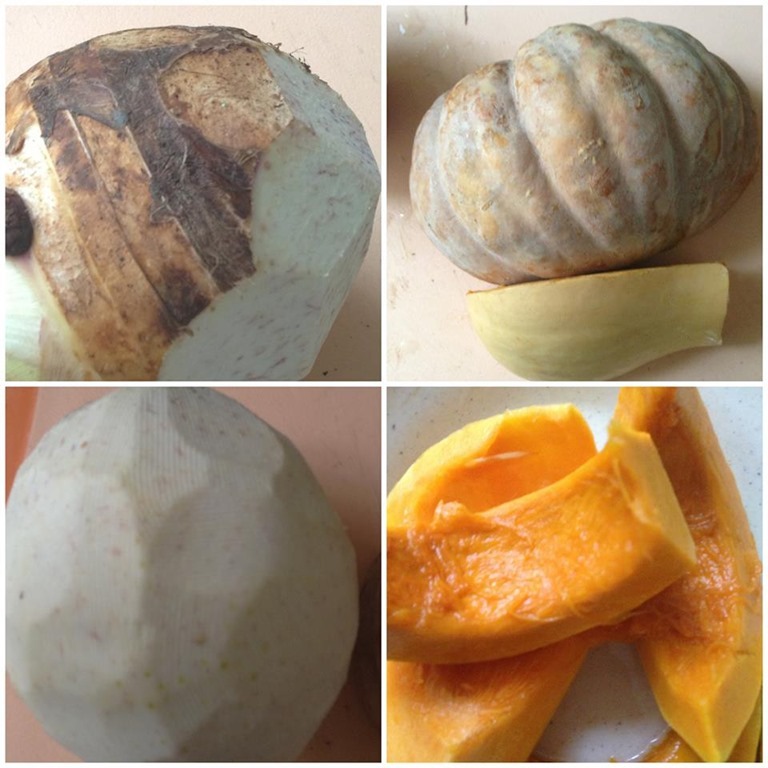 Slice the yam and pumpkin into small pieces and place in a steamer. Steam the taros and pumpkins until soft. It will take about 20-25 minutes (depending on the heat). Pumpkins will be cooked much faster. You can use a fork to scratch the yam. As long as you can scratch it easily, it is considered as cooked. Use the fork to mash the hot yam until fine. You can also use the potatoes masher to mash the yam. All these need to be done when the yam is hot. Depending on the type of yam used, some may not be easy to mash until smooth. As an added measure, you may want to sieve the mashed yam such that the yam paste will be smooth. 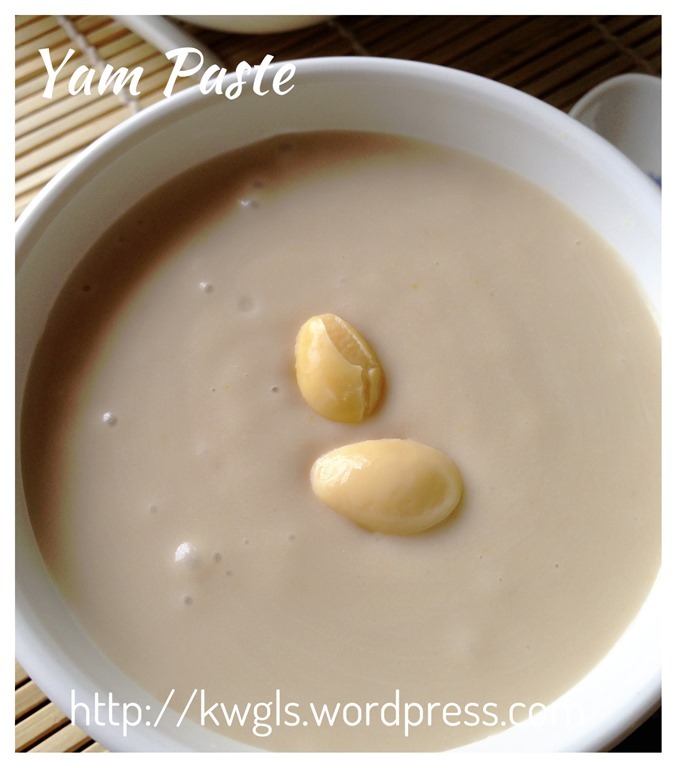 If the yam is too difficult to mash or sieve, you can add a few tablespoons of water. When the yam is hot, transfer to a plastic bag. Seal the opening and use a rolling pin to roll or “hit” until fine. For this method, sieving may also be needed if the mashed yam are too coarse. When the yam is hot, transfer the yam to the food processor and blend until as fine as possible. 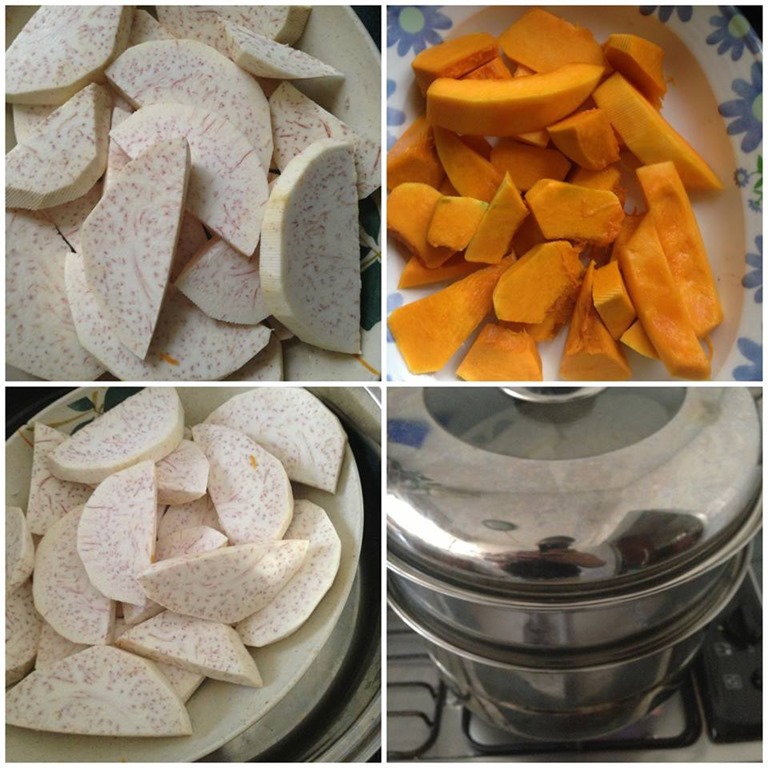 Generally, you will be able to get a higher recovery rates from this method (meaning most yam can be used) and the mashed yam is more finer too. 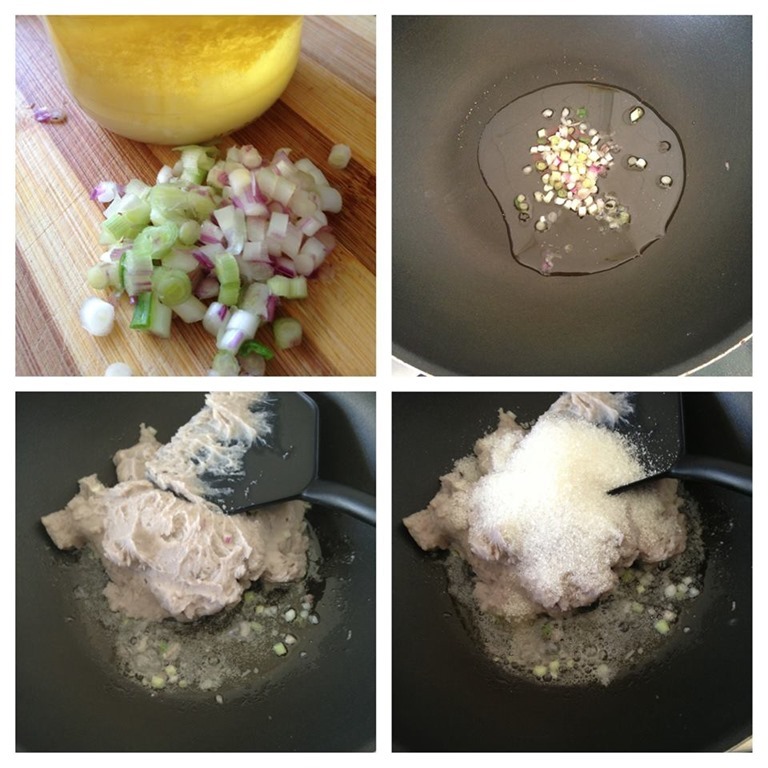 In a frying pan, have some lard or cooking oil and put in the chopped spring onions. Stir fry until it is slightly brownish and aroma start to spread to the house. Add in the yam paste and sugar. Stir fry until well mixed. If it is overly sticky to stir fry, add a few tablespoon of water. 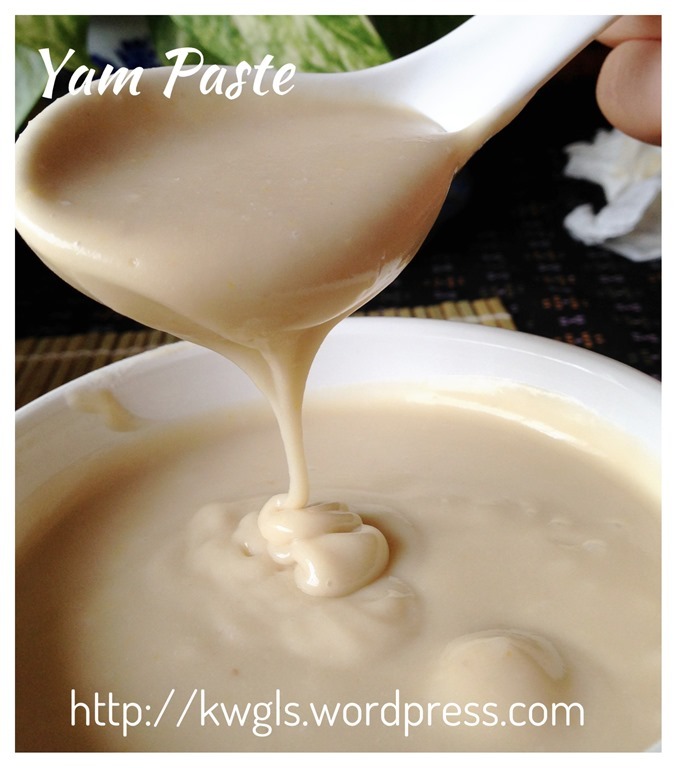 Transfer the stir fried yam paste to a greased bowl, level it and add additional 1 tablespoon of lard or shallot oil on top of the yam paste. Steam under high heat for about 10 minutes. 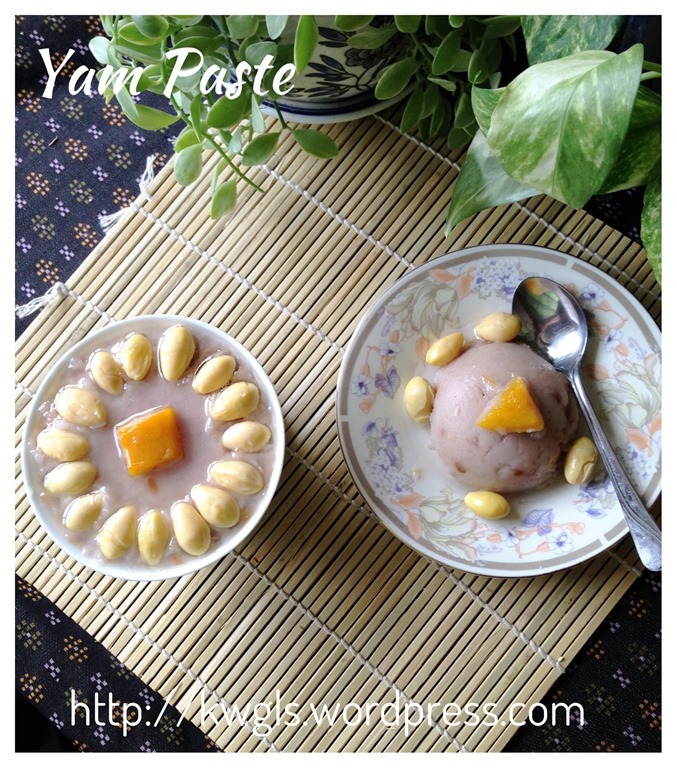 Off the heat, place on top of the yam paste some gingko nuts and steamed pumpkins before serving. 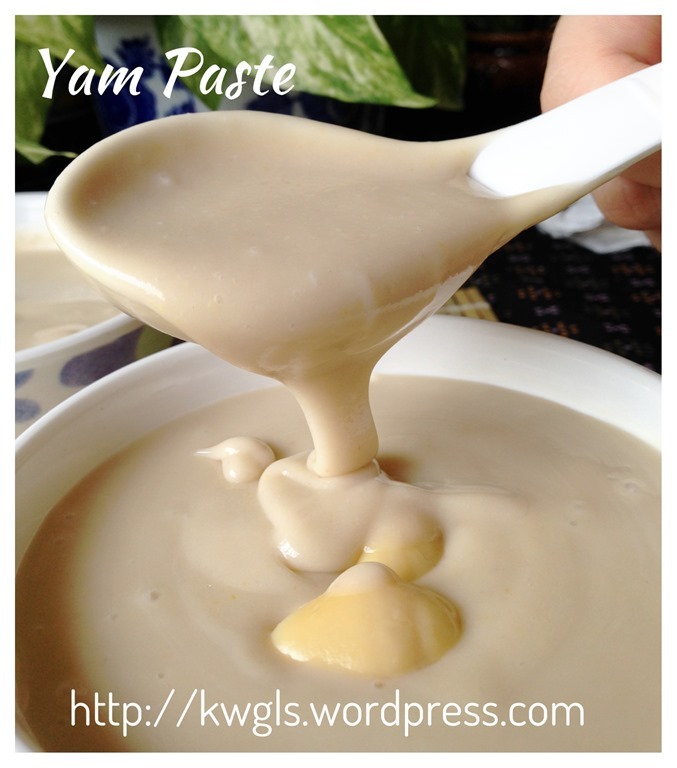 Preparing creamy yam paste – If you prefer your yam paste to be creamy, put the cooled yam paste, add some milk or coconut milk in a blender and blend until smooth. 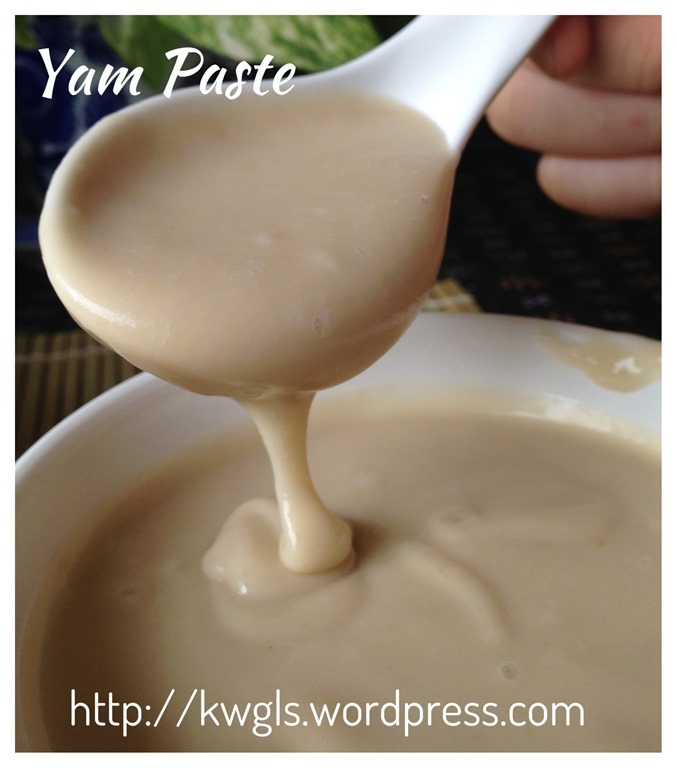 As for the amount of liquid to be added, it will be about 20% of the weight of your yam paste. Depending on the consistency that you are looking for, you are advised to add the milk gradually. As the milk will dilute the sweetness, additional sugar may be needed. 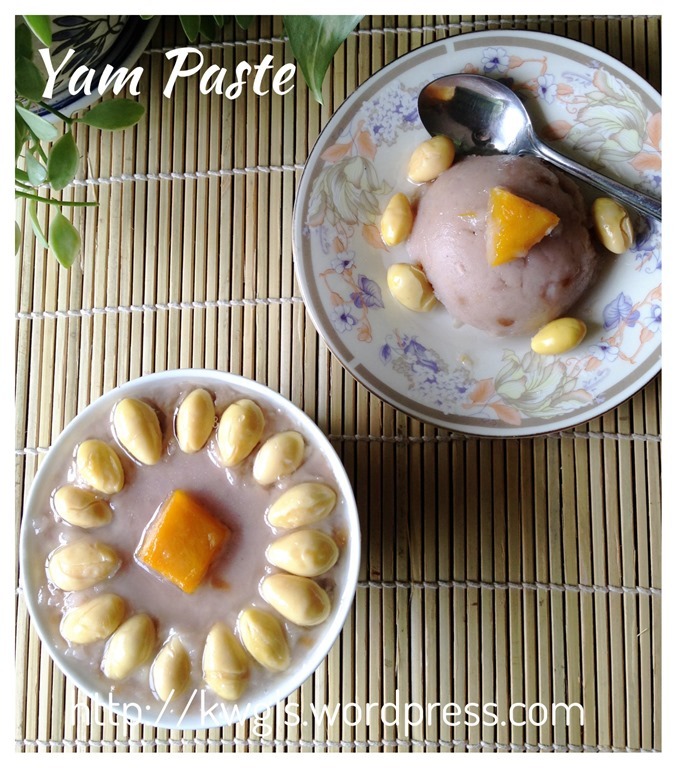 For this illustration, the net yam paste is 500 g and I have added 100 g of sugar. It is just right for me but you can gradually add the sugar until it suits your taste buds. This is an old recipe and rewriting the recipe is actually tougher. Remember that a good yam paste depends very much on the type of yam that you can get hold of and the oils used to cook the yam paste. 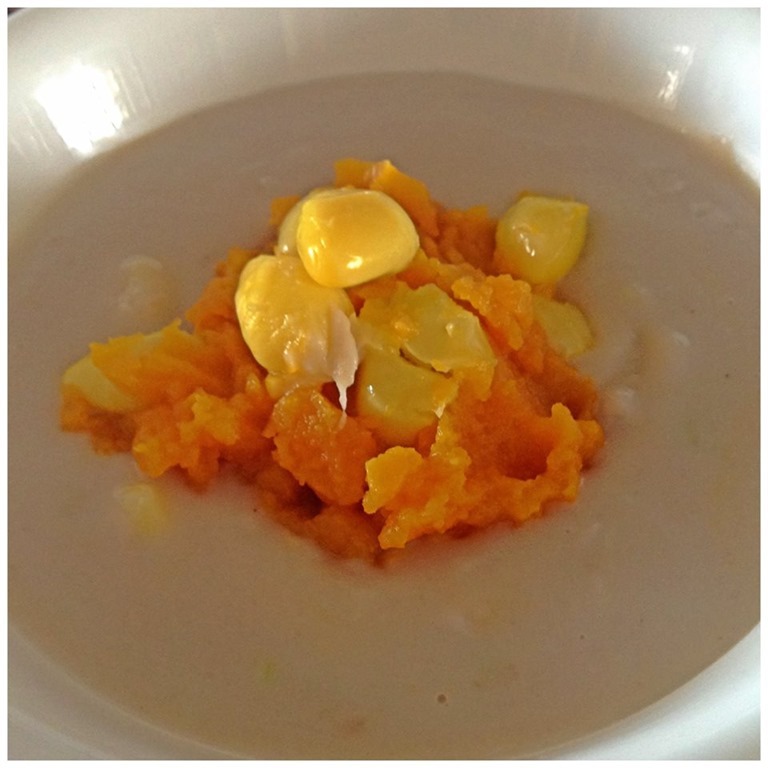 If you are health conscious, after blending the yam paste, add sugar and proceed to steam for 10 minutes… Drizzle with coconut milk before serving. Is it not the preparation was easy? 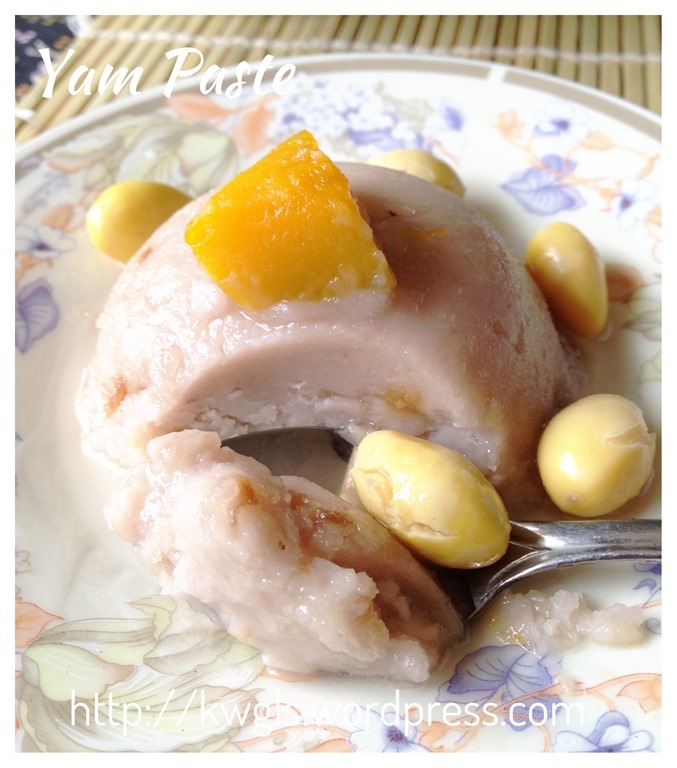 This entry was posted in Desserts, Food Preparation Series, Snacks and tagged 8, 芋泥，orh nee, GUAI SHU SHU, Guaishushu, kenneth goh, oh nee, oni, postaday, Yam paste. Bookmark the permalink. Thanks for this post as I have been surfing the net for Orh Nee the past few weeks. I will give this recipe a try but will opt out the coconut milk. I prefer the Orh Nee in thick version. After mixing in the milk, do we steam it again? and how long can we keep for the non-milk version and milk version? is there a way to prolong its freshness? yes, you need to re-steam. AFter properly cooled, deep freeze it should be quite long. Unsure how long.